MMA is not only for men, something that can be seen by the multitude of talented and dominant female MMA fighters. So, what are some of the biggest names in the female world of MMA right now? There’s a reason she’s called the cyborg, and it is because she powers her way through her opponents like a relentless robot. With a current win-loss record of 20 – 1, who her next victim is set to be is still to be determined. The Brazilian fighter has spent the last few years working her way to the top of the MMA female division, knocking out mostly anybody in her path. Amanda “The Lioness” Nunes is quickly becoming one of the hottest female names in the MMA. Since Ronda Rousey left, Nunes has been the stabilizing factor and the top force, having defeated the likes of Raquel Pennington, Miesha Tate, and Valentina Shevchenko. Amanda Nunes currently sits at 17 – 4 in terms of her win – loss record and is currently looking for a new victim to add to the loss column. There is a good reason why they call her “the bullet”, and it’s because she’s lighting fast, packs a big punch, and when she connects, bodies hit the ground. Interestingly enough, 2 of her 3 losses came against Amanda Nunes. She’s from Kirgizstan, she fights out of Peru, and she uses her combination of Muay Thai and Boxing to beat her opponents into submission. Her 16 – 3 win – loss record really does speak for itself. Rose Namajunas has not even hit her late 20s and she is absolutely dominating the woman’s straw-weight division in the UFC. This American fighter is aptly named “Thug” because that is what she does best: go to the ring and beat people down. She’s not a very big fighter, but she certainly does pack a punch, as can be seen by her impressive 8 – 3 win – loss record. This is truly one hell of a fighter, as you can probably tell by her 15 – 3 record. Joanna fights out of Coconut Creek, Florida, but don’t let the sweet area fool you, because this woman has tough as nails Polish blood in her veins, and she’s ready to take the fight to anybody that steps in her path. She may have lost her very last match, but her next one is no doubt set to be a winner. Holly Holm has been a fan favorite for a number of years now and there’s no mystery why that is. Holly is an absolutely captivating martial artist and watching her go to work is always a joy. Holm is a boxer through and through, and you better believe that she’ll use those fists to knock your lights right out. She’s got a 12 – 4 win – loss record and she’s showing absolutely no signs of slowing down anytime soon. She might be called “The Preacher’s Daughter”, but she is no saint when it comes to the octagon. With a really scary look and an even scarier win – loss record, Jessica Andrade is somebody whose way you definitely do not want to get into. She has got a very impressive 19 – 6 win – loss record and is currently riding high atop of a 3 win streak. She’s from Brazil, she fights out of Brazil, and she fights like a true Brazilian, with a whole lot of courage and passion, and absolutely no quit. Suarez might not have been in the MMA for very long as of yet, but she is quickly working her way up the ranks and is literally bulldozing any competition that dares get in her way. Fighting out of California, using her pure wrestling style of fighting, Suarez has managed to secure 7 wins and no losses in the short time she has been fighting in the octagon. When she’s not rocking that dazzling smile, she’s rocking the competition with those big slams and takedowns. Born in the Netherlands and fighting out of California, Germaine has quickly made a big name for herself by being one of the most talented fighters in the octagon at this time. She’s a kickboxer by nature, and you better believe that those big head kicks will take out the competition as soon as they connect. She’s got an 8 – 3 win – loss record and is currently riding high on a 4 win streak. 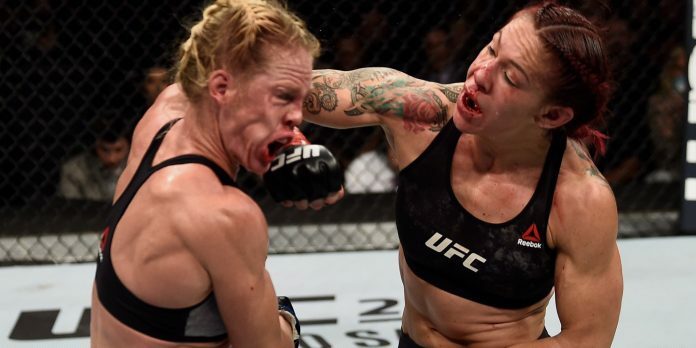 Julia Budd may be a bit old for a UFC fighter, being 35 years of age, but she has proven time and time again that she is absolutely not past her prime. She’s got an impressive win – loss record of 12 – 2, and has not lost her last 10 fights. She’s a really hard hitter and she knows how to put a decisive end to any fight! Currently Vieira is one of the most dominant forces in the female division of the MMA. She’s currently on a winning streak of 10 wins, and you better believe that she has not lost a fight yet. This Brazilian born fighter has been on top of the bantamweight division ever since her debut and it has not changed since. Who her next opponent will be is yet to be determined, but we do feel sorry for anybody who has to fight this absolute beast. There are not too many dominant Japanese fighters in the women’s division of the MMA right now, but Ayaka Hamasaki is one of the few who has been holding her own. With a main fighting style of Judo, Hamasaki has been the pride of Japan with an impressive 17 – 2 win – loss record. She’s not very big and she’s getting up there in years, yet still remains a very dominant force. You best believe that there are plenty of women ready to dawn fighting attire and lay it all down in the octagon!